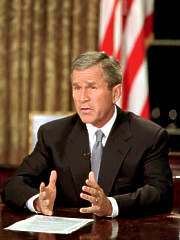 The following proclamation was made by George W. Bush just two months after the 9/11 attack on the World Trade Center. Nearly half a century ago, President Dwight Eisenhower proclaimed Thanksgiving as a time when Americans should celebrate "the plentiful yield of our soil . . . the beauty of our land . . . the preservation of those ideals of liberty and justice that form the basis of our national life, and the hope of international peace." Now, in the painful aftermath of the September 11 attacks and in the midst of our resolute war on terrorism, President Eisenhower's hopeful words point us to our collective obligation to defend the enduring principles of freedom that form the foundation of our Republic.